Well, it looks like the postman was busy today. After work, I opened up my mailbox, and much to my surprise, there were a few packages waiting for me, two from trades and one from a fantastic giveaway. The first is from Larry the Sewing Machine Guy. I went to his blog a week or so ago and read about his box of 2010 Topps 206. 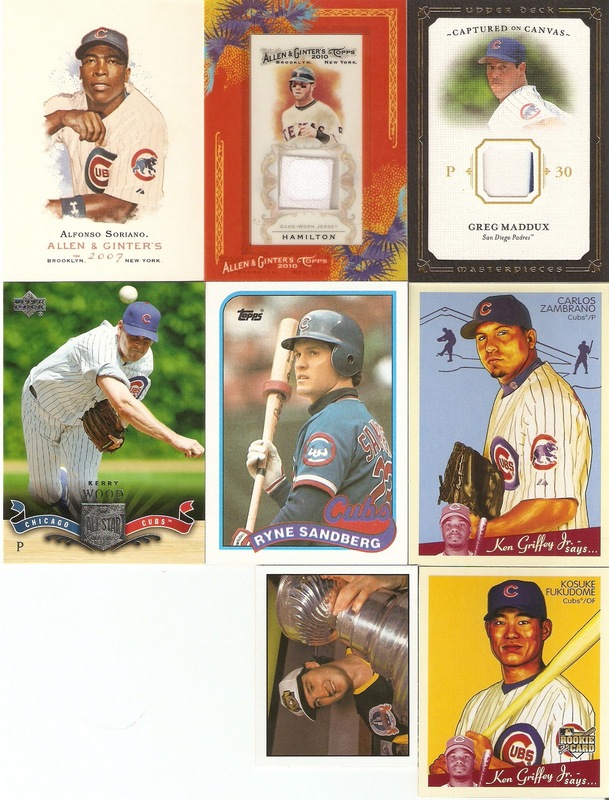 While he was a bit underwhelmed with the look of this year's set, he pulled what this Cubs fan would call a jackpot, getting a Giovanni Soto jersey card and a Frank Chance silk card. While most would simply scan over something like this, when you consider the amount of teams and players possible, getting two from my favorite team is quite the rarity. Of course, I had to have them. He was also incredibly generous with the Allen & Ginter cards he sent me, all of which I believe, are short prints. I also found a trade package from Greg at Plaschke, Thy Sweater is Argyle. I sent him a ton of 1989 Topps and 2010 Allen & Ginter to chip away at his want list, and in return, I received quite a few 2010 Topps Heritage to put in my collection. 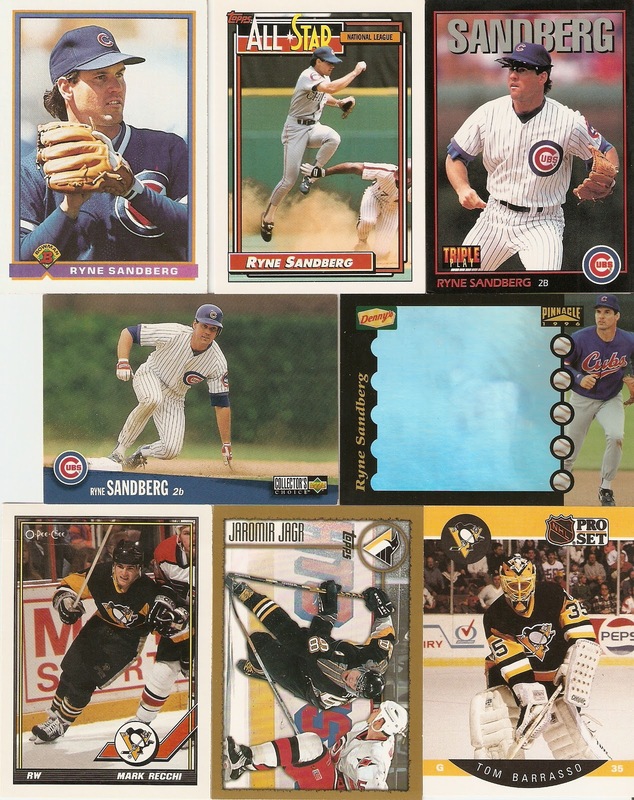 He was also able to send a few Ryne Sandberg cards my way, along with a couple of Pittsburgh Penguins. My favorite was definitely the Denny's hologram, which is my first of that type. Despite the fact that he is wearing the ugliest Cubs jersey in team history, the hologram shows him turning a DP at second. Thanks for the cards everyone. I look forward to plenty more trades in the future. Well, I've decided to change the name of my blog yet again. I started out with My Cardboard Obsession, but it sounded too much like a Calvin Klein cologne ad. Then I went with "Who Own Da Chiefs" in reference to my favorite sports movie, Slap Shot, but someone had already registered the web address, so I had to add my name to it, which got to be too wordy. I had considered going with "Hey Hanrahan!" but it would require an awkward explanation which would offend most people I told it to, and great lines like "The ******* machine took my quarter" and "That **** is no good," were just flat out profane. I think I'm going to stick with this one, though. For one, I think it's at least catchy and memorable, plus it (kind of) rhymes. And although I may be thinking WAY too ambitiously, the web domain itself is available and would make a great name for a podcast. 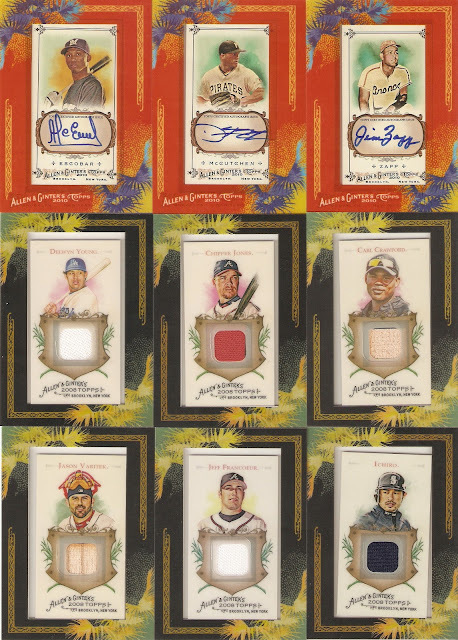 Although I have just gotten my feet wet in the internet card trading community, I would definitely like to do something more with this than just posting random Wal-Mart blaster box breaks. I did, however, pick up a pretty cool card for my Kerry Wood personal collection this week. 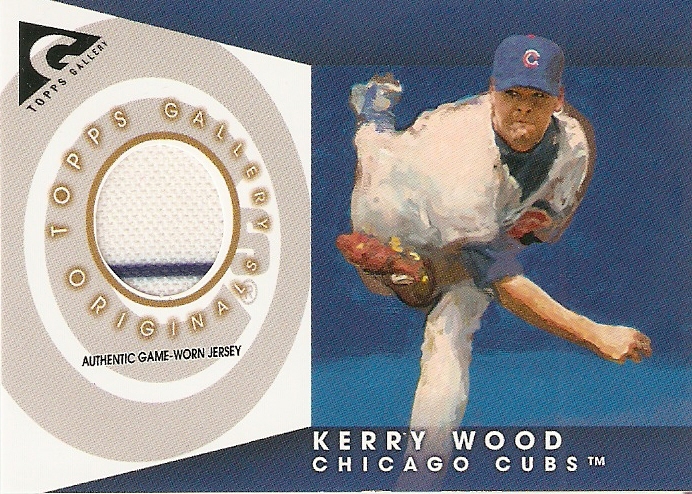 It is a Gallery Originals jersey card from the 2005 Topps Gallery set. The condition isn't quite mint, as a little bit of the blue has rubbed off on the bottom and there appears to be a little bit of a crease where the hole was cut, but the card is fantastic looking. I always love the painted sets, whether it's 2010 Allen & Ginter or 1987 Donruss Diamond Kings, plus I love the way the swatch is framed, even though the stripe is horizontal. The kicker with this card is that I purchased it for the ultra low price of $1.25 with free shipping. When I received my package a few days later, the shipping label showed a charge of $1.22. Essentially, the seller made a mere three cents. Now I know that Wood is nowhere near the player he was in 1998, when he struck out 20 Astros in a game, but he's worth much more than 3 cents. After not getting too much into football cards the past few years, I decided to dive back into it over the summer. For one, I really enjoyed the Topps set this year, especially with the Million Card Giveaway. I didn't get anything of note out of 11 tries, and nothing earlier than 1986. Oh well, it was worth a try. I did, however, nab a few hits. 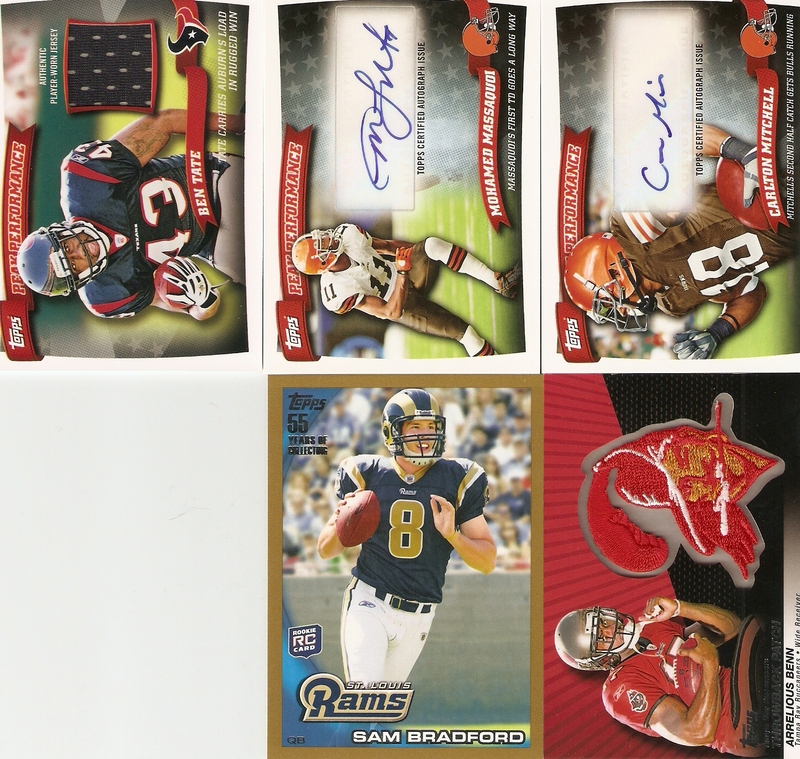 Out of a blaster box, I pulled an Arrelious Benn Throwback patch, and had a few jumbo pack pulls, including a Gold Sam Bradford, a Ben Tate jersey and autos of Mohamed Massaquoi and Carlton Mitchell. The Texan is mine, but any of these others are available for trade. I also decided to sample a few Panini products, including a box of Classics. Four hits were promised out of 24 packs, and I was extremely satisfied with what I found. 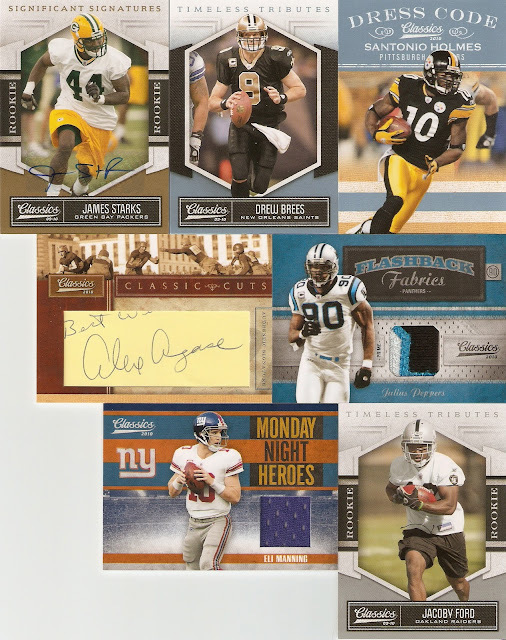 With the parallels, I discovered a Drew Brees Timeless Tributes and Santonio Holmes Dress Code, both numbered to 25 and a Jacoby Ford Timeless Tributes Rookie, numbered to 99. The two autos were of Packers rookie James Starks and a Classis Cut of Alex Agase, who played in the 40s and 50s before becoming coach at Northwestern University, I think. Despite not being too familiar with Agase, I was thrilled with my first ever cut signature pull.was also pleasantly surprised with my jersey pulls, an Eli Manning Monday Night Heroes jersey and a Julius Peppers Flashback Fabrics Prime jersey patch. Both are fantastic looking cards, espeially the Peppers, with the colorful Panthers fabric. Lastly, I decided to buy a few packs of Threads, also from Panini. While I wasn't as in love with the base design as I was with Classics, they still have a nice look to them if you just want to bust open a few packs. 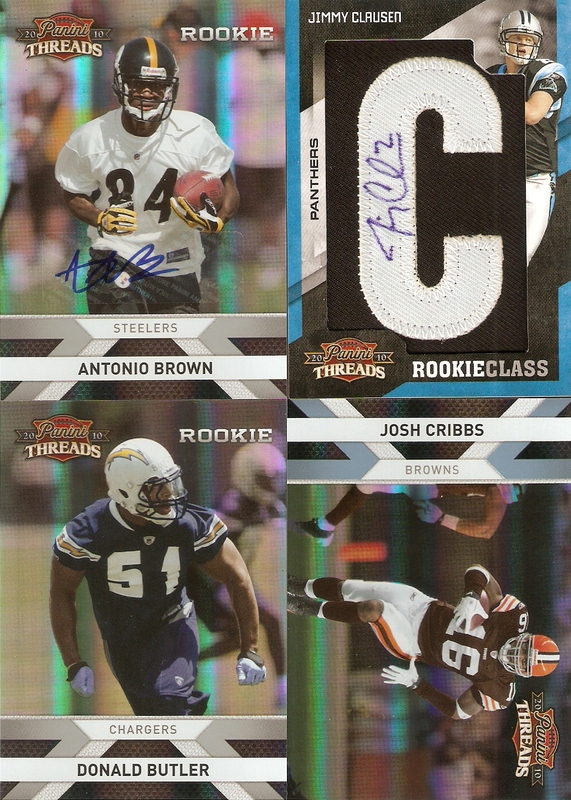 As far as the base set goes I found a rookie of Donald Butler and a base of Josh Cribbs, numbered to 25. I also opened up an auto of Steelers rookie Antonio Brown and a Rookie Class autographed letter of Panthers quarterback Jimmy Claussen. As always, let me know if you are interested in any of these. Had a good weekend in the trade department. My first package was from Nachos Grande and easily, the top two items were my relics of Josh Hamilton from 2010 Allen & Ginter and Greg Maddux from 2008 Upper Deck Masterpieces. He also threw in a few random Cubs, as well as a few to add to my Sandberg, Wood and Zambrano collections. 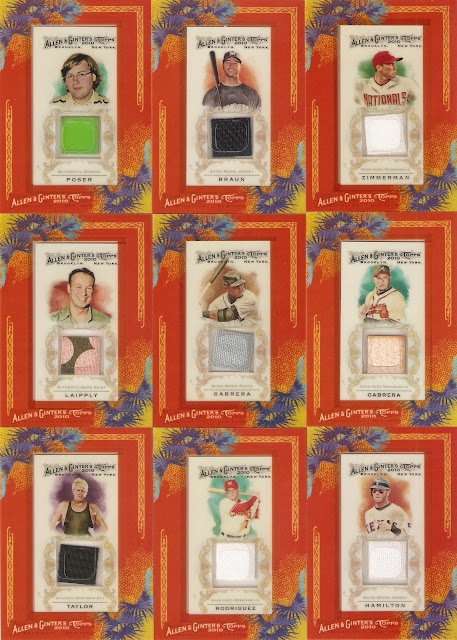 But more important than anything was the 15 or so cards I needed to finish my 2010 Allen & Ginter base set with SPs. Thanks! The other package arriving in my mailbox was from The Daily Dimwit. 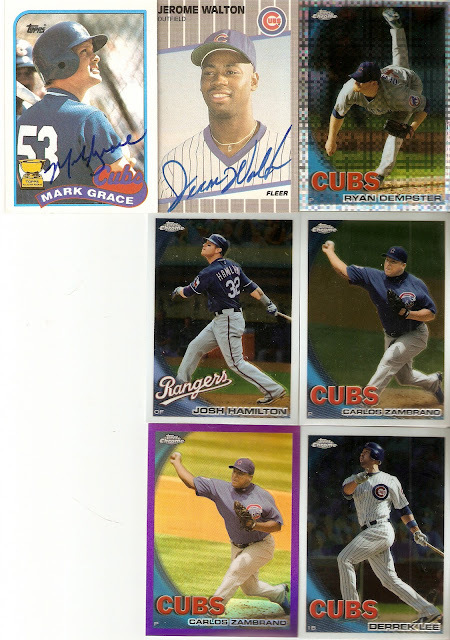 I had won a contest on his blog not too long ago, so I knew I had a couple of Cubs autos on my way, along with some Topps Chrome cards from a recent blaster break he did. But much to my surprise, he also included the three 2010 Topps cards I was looking for to (FINALLY) complete my series 1 and 2 sets. 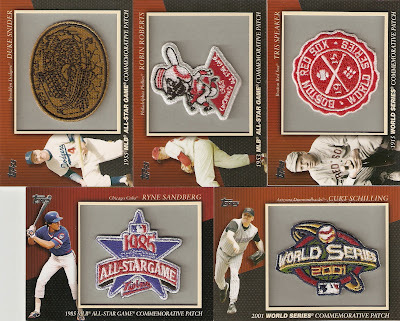 So I can now safely say that Topps will no longer be getting any money from me, at least until the 2011 set is released. 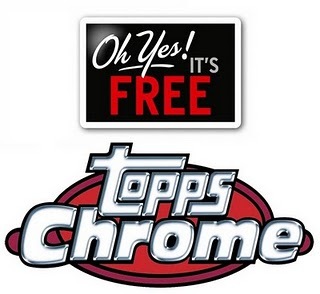 Hey everyone, Georgia Mindset is having a fantastic contest for a free box of Topps Chrome. Go here for more info. Considering the low price tag, coupled with the fact that I'm too impatient to wait for the Upper Deck set to be released, I decided to pick up a blaster of 2010-2011 Victory. 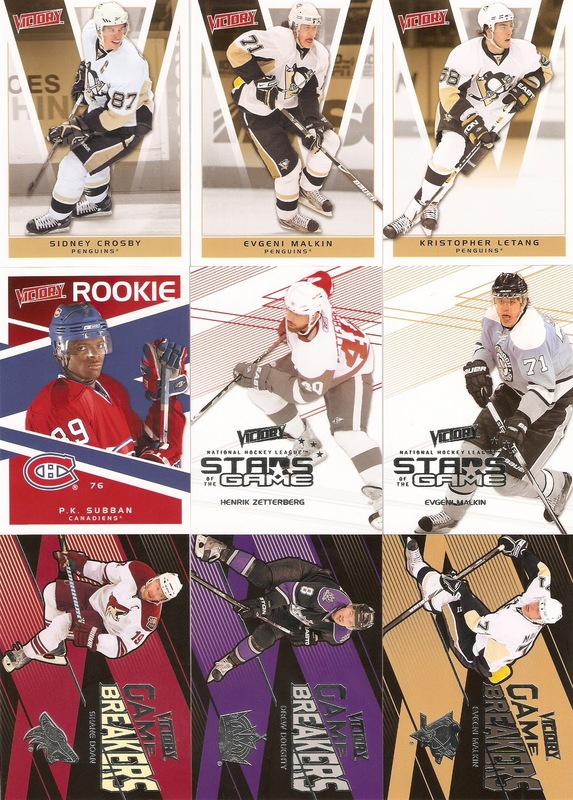 This set is Upper Deck's low-end hockey product, similar to Topps Opening Day in baseball, where they just want to get something quick and easy out on the market. 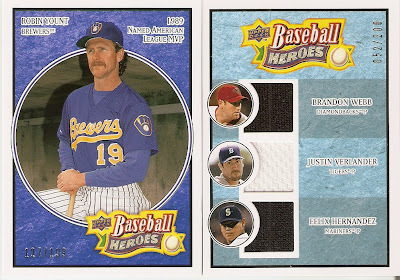 There were 11 packs of six, which included 5 base cards and one insert/rookie. Penguins Pulls: 5/66 (8%). I got the two Malkin inserts, plus base cards of Sidney Crosby, Malkin and Kris Letang. A great box for the black and gold. Stopping my the sports card area of my local Wal Mart, I spotted a discounted blaster box of 2008 Upper Deck Baseball Heroes on sale for only $8.97. Looking at the description, the box contained 7 packs of 5 cards, plus 2 bonus packs for a total of 45 cards. There were no guaranteed hits, but for the price, I figured it was worth picking up. 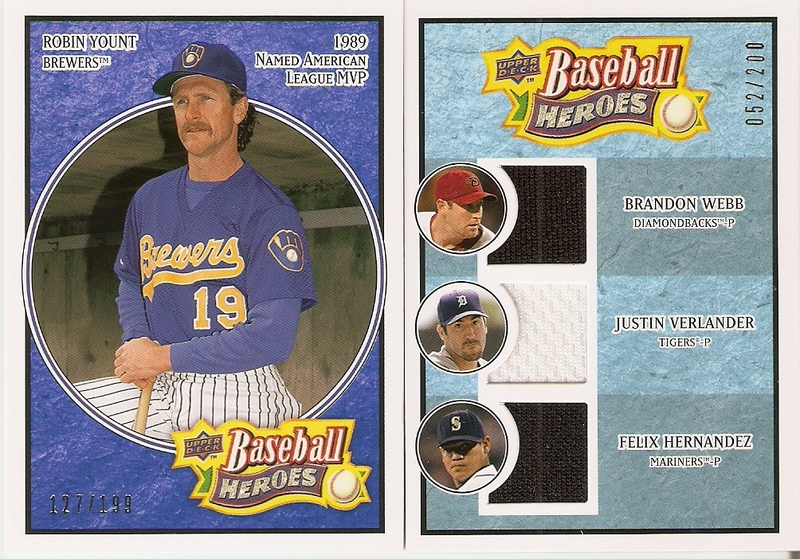 I was quite surprised, then, to discover my first-ever multiple swatch pull: A triple jersey card of Brandon Webb, Justin Verlander and Felix Hernandez, numbered 52/200. Some of the best pulls are the ones you least expect. No matter who the player, or players, are, it's always good to be surprised. Cubs Count: 5/43 (12%). A fantastic ratio for this Cubs fan. 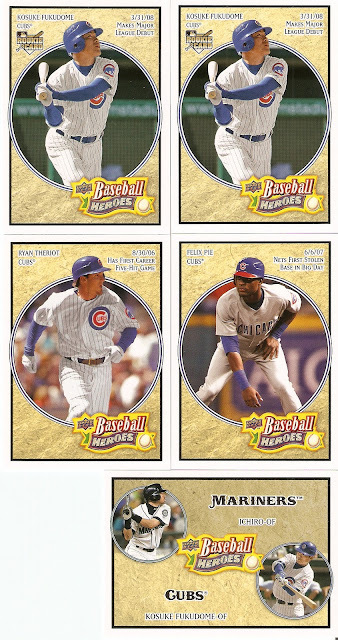 However, what I happened to get shows some loose definitions of what constitutes a "Baseball Hero." I understand Kosuke Fukudome being the hot rookie import, but Ryan Theriot? Felix Pie? Even with my North Side bias, that's a bit of a stretch. But beggars can't be choosers, I suppose. Overall, I was pretty happy with what I found. 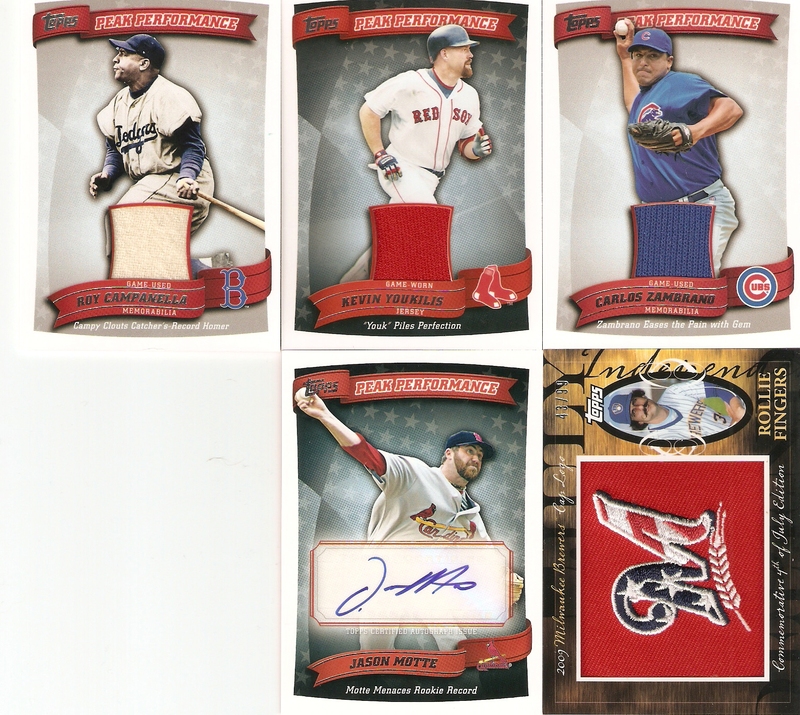 The cards look nice, I pulled a few Cubs and I got a nice surprise with the relic card. Definitely worth my nine bucks. Due in large part to the Million Card Giveaway, I really got into Topps baseball this year. I really liked the idea of buying a random pack of cards and essentially finding something from the 50s or 60s. Unfortunately, I sson found out that with all those vintage cards are some commons from the late 80s and early 90s that aren't even worth the shipping it would take to get those cards. 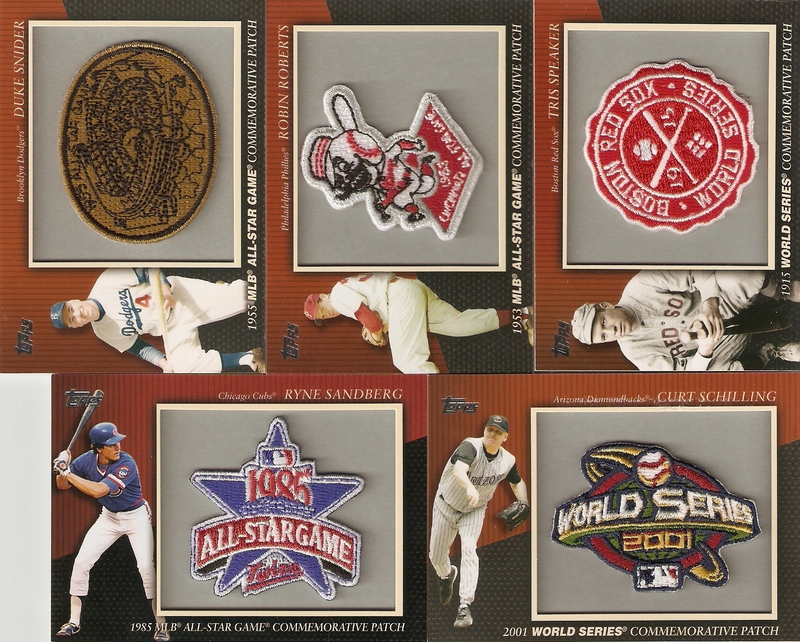 Blaster Patches: Duke Snider, Robin Roberts, Tris Speaker, Ryne Sandberg and Curt Schilling. 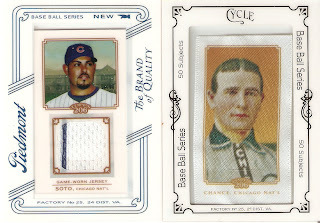 As a life-long Cubs fan, I love the Zambrano and Sandberg cards and as a fan of old-time baseball, it was cool to get the two Brooklyn Dodger cards. While some people wouldn't be happy with their hits being a domino champ, a high diver or a YouTube dancer, I thought that it definitely gave something different. For me, the best way to get my attention is to give me something I can't find anywhere else. 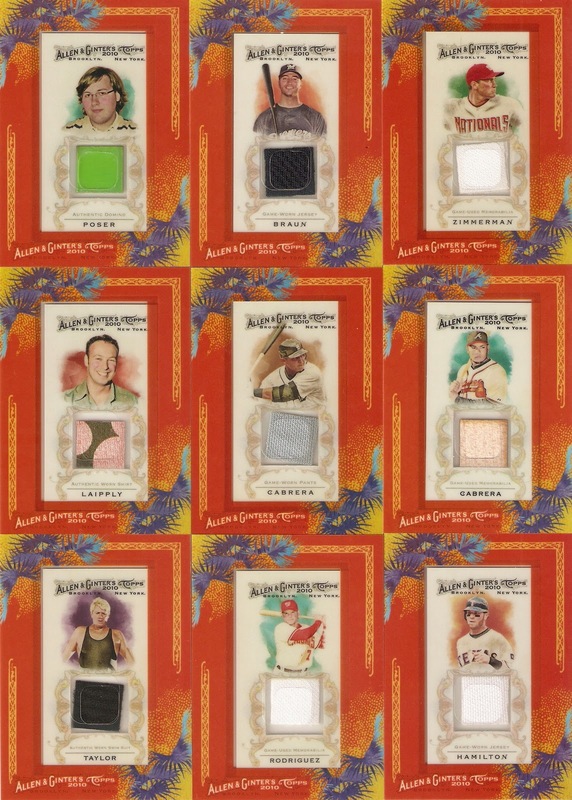 The relics above are Max Poser, Ryan Braun, Ryan Zimmerman, Judson Laipply, Miguel Cabrera, Melky Cabrera, Darren Taylor, Ivan Rodriguez and Josh Hamilton. From 2010 I got three autos: Alcides Escobar, Daniel McCutchen and Jim Zapp. From 2008, I got relics of Delwyn Young, Chipper Jones, Carl Crawford, Jason Varitek, Jeff Francoer and Ichiro. 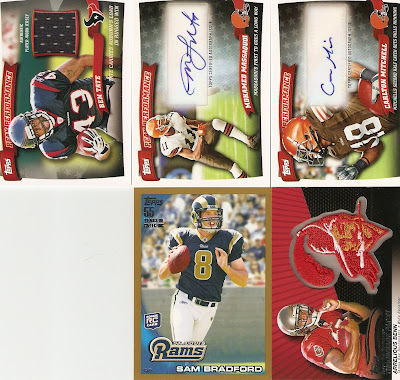 By the way, Sam at The Daily Dimwit is having a contest for a couple of autographed cards. If you're a Cubs fan like me, it's worth checking out.